Livin’ On The Edge is the perfect name for this beautiful cabin extending out over a mountain with stunning long range view’s. The main level of the home has been fully renovated with solid surface countertops and stainless appliances, new furnishing and décor. This 3BR 3BA home sleeps up to 10 people comfortably with 2 king beds, 1 queen bed, a day bed with trundle and a full sleeper sofa. There is a full bath on all three levels of the home. The game room has a pool table and foosball table for some friendly competition. Both levels of the home have large decks with amazing views plus the master has its own private balcony for sipping your morning coffee. And of course the Hot Tub, perfect for relaxing after a day of outdoor activities. 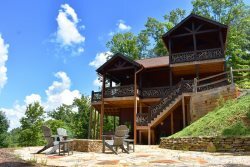 Don’t miss out on the many unique activities and outdoor experiences North Georgia has to offer. Meander the streets of Blue Ridge where you will find one of a kind shops, breweries and eateries. Take a ride on the Blue Ridge Scenic Railroad, Hike the Appalachian Trail, Visit a Waterfall or Swinging bridge, Tube, Kayak, Paddle Board or White Water Raft the Toccoa or Ocoee River’s. Go boating on Lake Blue Ridge or step back in time and watch a first run movie at the famous Swan Drive-In Outdoor Theater. And of course Mercier Orchards is a must. There is always a festival or event happening here in the mountains so book today. We loved every bit of the cabin from the location to views and all the little ways you made it cozy. We had all we needed. Thank you!! We loved my birthday getaway! Only wish we had more tissue/paper towels. Something that we will remember for the next trip! The cabin is beautiful. Has everything you need plus extra. Great views. Very clean.